Can natural resources exploitation continue as a no-limit business? If measures have to be taken, what are they? Are compromises possible or should certain activities simply be stopped or dramatically reduced, with the economic consequences that we can imagine, including for employees? Distinguished speakers of diverse backgrounds examined these issues during the Main Theme Session on “Natural Resources Exploitation: Business and Human Rights”, held on 28 October 2017 during the UIA’s 61st Congress in Toronto. 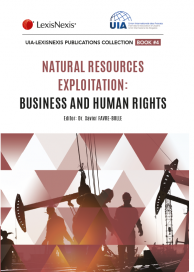 This fourth book in the UIA-LexisNexis Publications Collection contains the speakers’ written contributions to the Congress, as well as contributions of other experts in the field, and examines the legal issues arising from the exploitation of natural resources on a legislative, administrative and contractual level, in addition to focusing on compliance mechanisms, dispute resolution and other mechanisms for redress.